1. For iPhone，no synchronization App available now，besides Receive SNS text, Bluetooth Message, Remote Capture, Anti-lost all the other functions are available. 2. This product does not contain any SIM CARDS or SD/TF CARDS. If necessary, please purchase separately. 3. Any issue with this product please feel free to contact us, we will help you solve it. How to download and install the sync App (only for Android)? 1 Please download the sync App to your smart phone by scanning the QR code. This App will only be used for the synchronization between your phone and the watch, will not take any data of your phone. 2 You can also search it's name ' BT notification 'in the play store or internet to download and install this App. 3 If you have already installed the App, please check the version and update to the newest, so that all of the features can be used normally. Please update the App when it has a new version. 4. Now you have paired your phone with the watch, the Bluetooth will connects automatically. 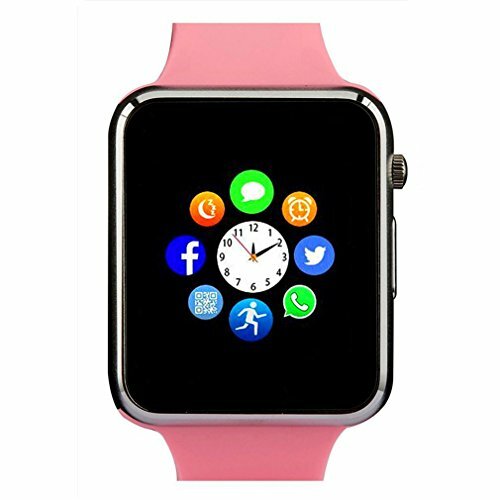 Standalone Phone: When inserted GSM 850/900/1800/1900 MHz SIM card and TF card in this smartwatch, it can work as a real standalone cellphone, you can make calls, messages, surf the Internet, use other pre-loaded Apps with this watch. If you have any questions about this product by Amazqi, contact us by completing and submitting the form below. If you are looking for a specif part number, please include it with your message.